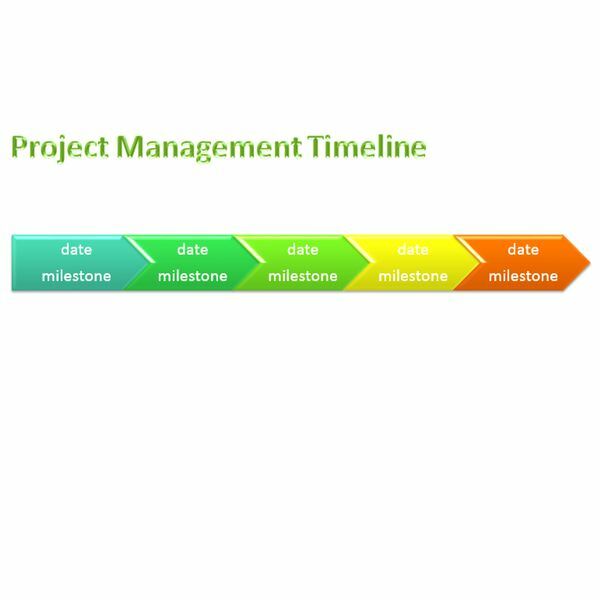 Your project management timeline can be as basic or as detailed as you like, but it is beneficial to complete the entire schedule prior to the beginning of the project. The timeline should definitely include a clear starting and stopping point as well as milestones along the way. Not only does this help you define clear, attainable goals, but it also encourages your team to prioritize tasks. You may also wish to incorporate resources required at specific points in the timeline. 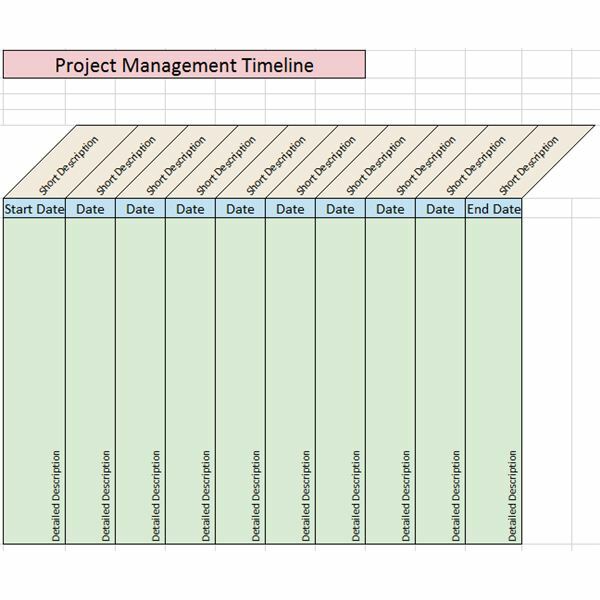 They can consist of basic lines with boxes containing dates and details or they may involve graphics and shapes, but most project management timelines are horizontal, proceeding from left to right on a landscape oriented page. If you prefer a basic timeline, you may opt to use Microsoft Excel or a similar spreadsheet program that provides grid lines to help you insert dates and items. Simply draw a long, horizontal line and type the start date at the left end and the projected completion date at the right end. Add significant dates in between with milestones you hope to reach by each date. In Microsoft Office, you can use SmartArt graphics to make the timeline. Choose a Process option from the SmartArt gallery and add your start, end and milestone dates and details. Alternatively, you can use one of the timeline templates provided here. This template utilizes Excel’s comprehensive formatting features to create an eye-catching timeline that provides adequate space for lots of details. The top of the page features a title, which you can modify by typing over the sample text or remove if desired by selecting and deleting. Enter each date you want to record into the cells in Row 7, beginning with the start of the project and ending with the closing date. Type brief descriptions for the milestone related to each date into the corresponding cells in Row 6. Enter full descriptions of the milestones in Row 8. If there are too many items on the timeline, remove empty columns by selecting the letter at the top of a column and pressing Delete. To add additional milestones, click the column letter to the right of where you would like another one. Right-click and choose Insert. In addition, you can change the colors of the timeline by manually selecting new fill colors or by selecting a new theme on the Page Layout tab. The timeline on this template was made using Word’s SmartArt feature. To change the page title, select the Insert tab, click on Header and choose Edit Header. Replace the sample text or make other changes using the features available on the Format tab under Drawing Tools. Replace the text on the template with your specific dates and milestones. To add more shapes to the timeline, click on a shape preceding the necessary addition. Click the Design tab under SmartArt Tools. Click the drop-down arrow next to Add Shape and choose Add Shape After. You can also modify the appearance of the timeline by selecting a different color scheme or SmartArt style on the Design tab under SmartArt Tools. If you want to include your timeline in a presentation, you may wish to use the PowerPoint template. This timeline was also created using SmartArt and is based on a PowerPoint design theme. Type over the existing title to add your own and replace the sample text with your specific dates and milestones. You can also modify the appearance of the timeline by selecting a different color scheme or SmartArt style on the Design tab under SmartArt Tools. 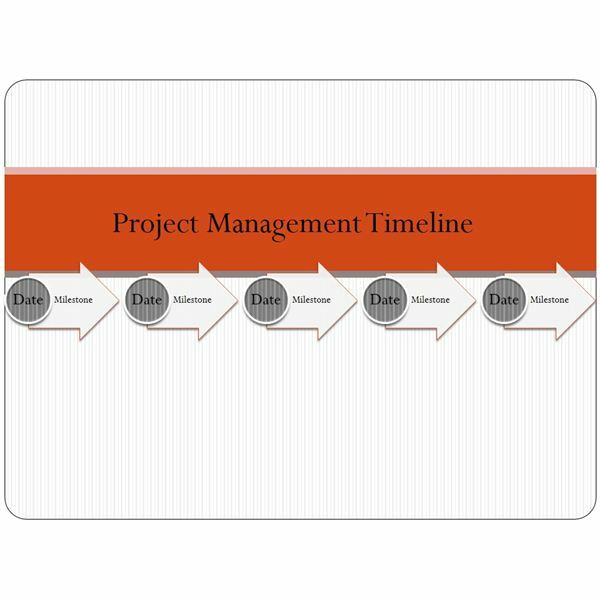 Whether you create your own project management timeline, use one of our templates or a combination of these, incorporating proper planning, preparation and presentation will help you design an effective and attractive timeline.